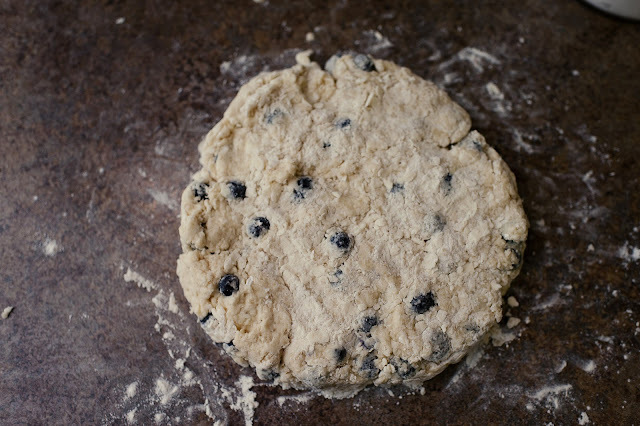 always enough energy to make blueberry scones. This is Martha Stewart's recipe! So you could just as easily go to MS Living and print it, but then you won't have all of the pretty pictures and my secrets. 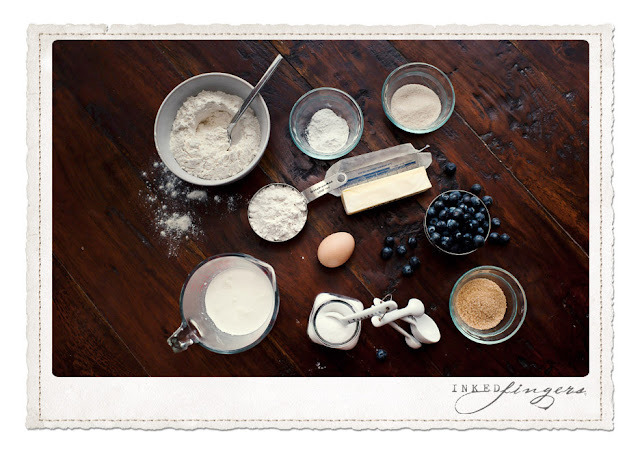 Lay out parchment paper on a baking sheet. Take a big deep breath in... Now sigh it away. 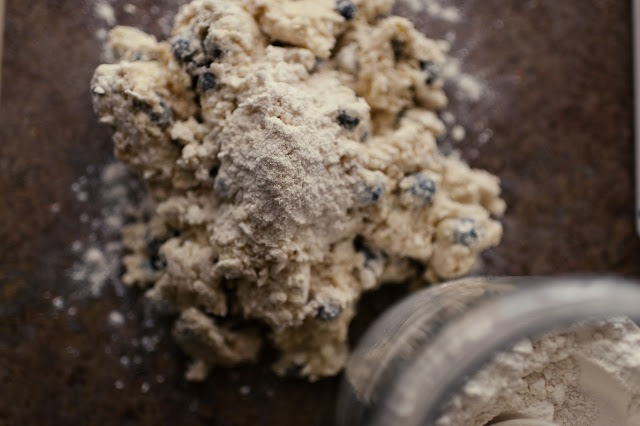 There is no rushing allowed when you're making blueberry scones. 1. 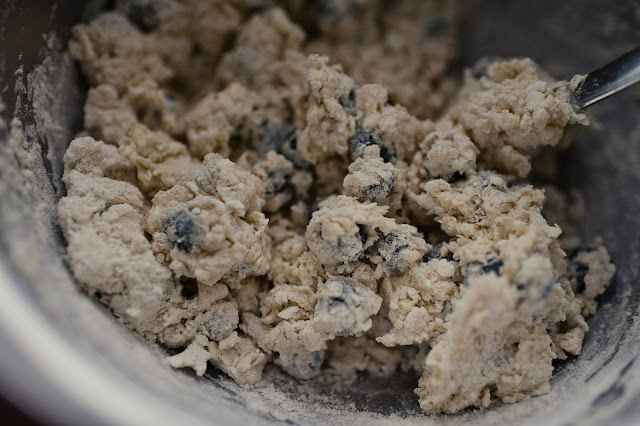 Combine the first 5 dry ingredients and set aside. 2. 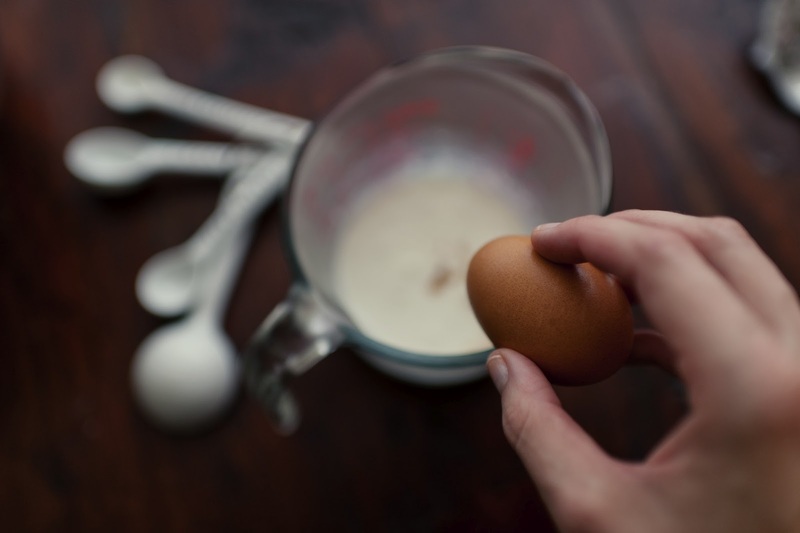 Combine the buttermilk, vanilla and egg in a small separate dish. 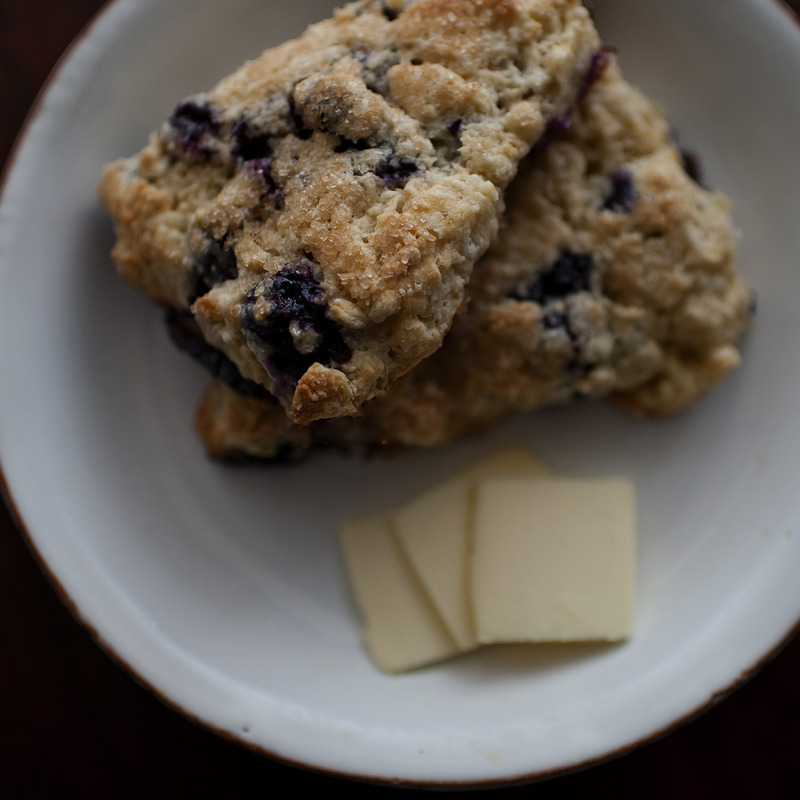 Let's say you forgot the buttermilk! Have no fear. I actually never buy buttermilk anymore! 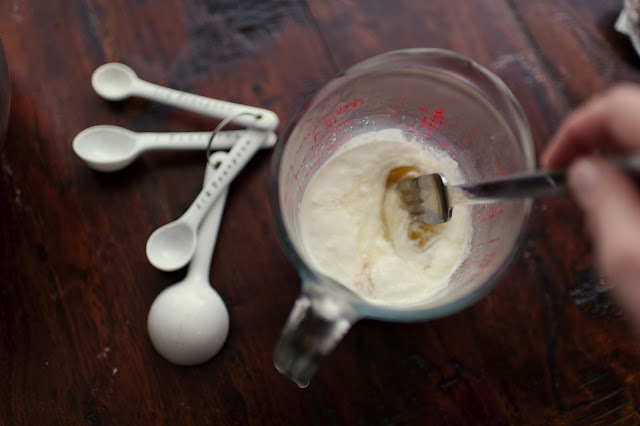 Just use 1 regular cup of milk (just shy of a cup, actually) and add 1 TBSP plus 1 tsp of vinegar. Let it sit and watch the milk thicken! It's magic. 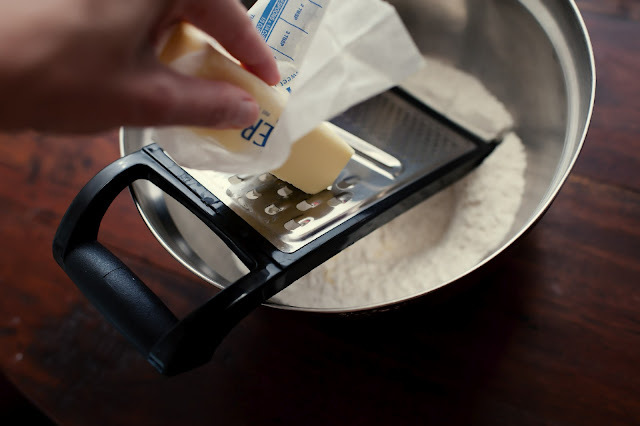 cheese grater, grate in the partially frozen stick of butter. We're trying to make this easier on ourselves, not more difficult! 4. Now I forgot to take a picture of one of the most critical steps! 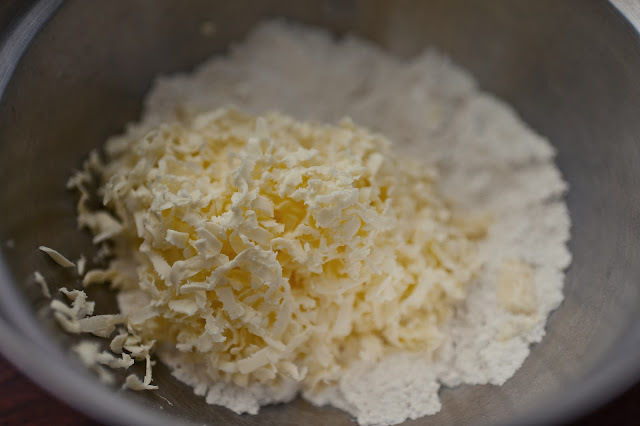 Combining the butter and flour! Use your hands! It should feel like course cornmeal. You can kind of see this in the photo below! 5. 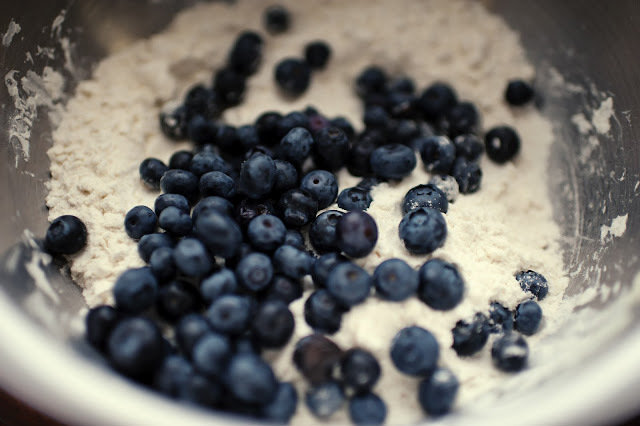 Add & gently stir in the blueberries. 6. Now drizzle the buttermilk mixture into the flour mixture. The next step is REALLY important! 7. 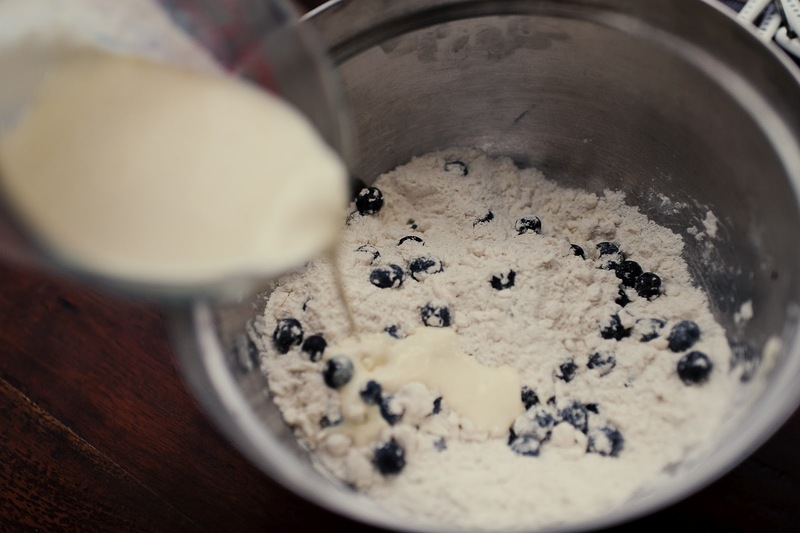 Gently combine the liquid and blueberry flour mixture. DO NOT OVER STIR! 8. Now the fun part! 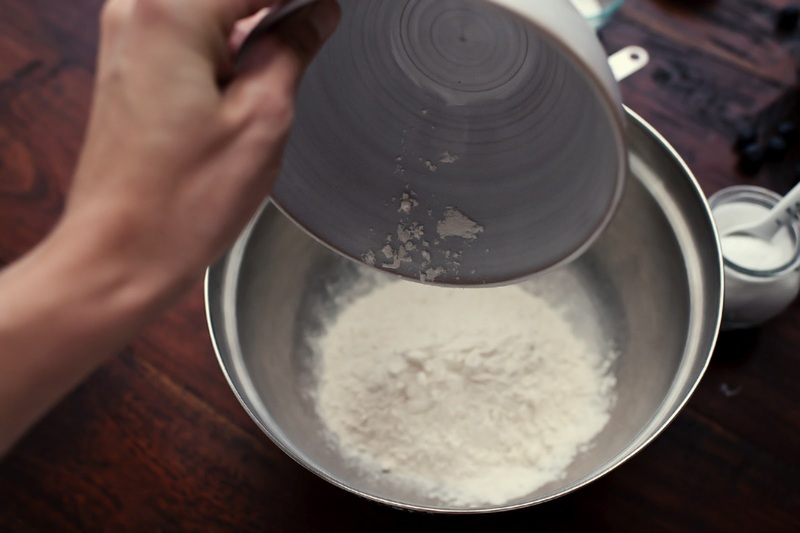 Dump it on a lightly floured counter, upside down! 10. Cut it like you're cutting a pie! 11. Whisk egg and heavy whipping in small dish. 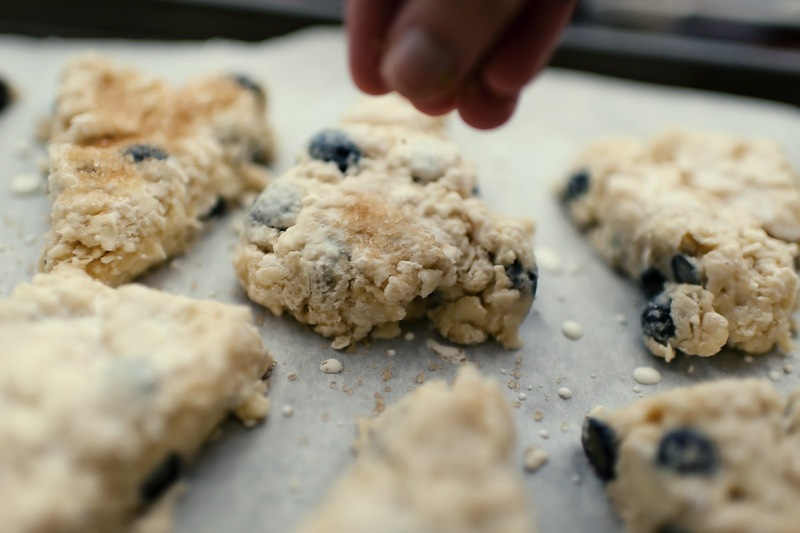 Carefully place scones on parchment paper. 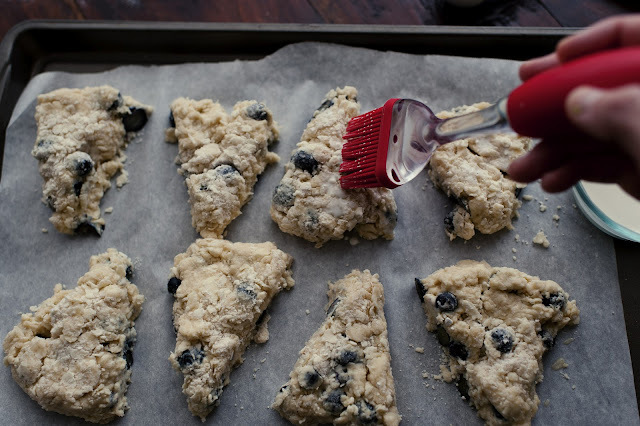 Brush the egg wash over the top of the scones. 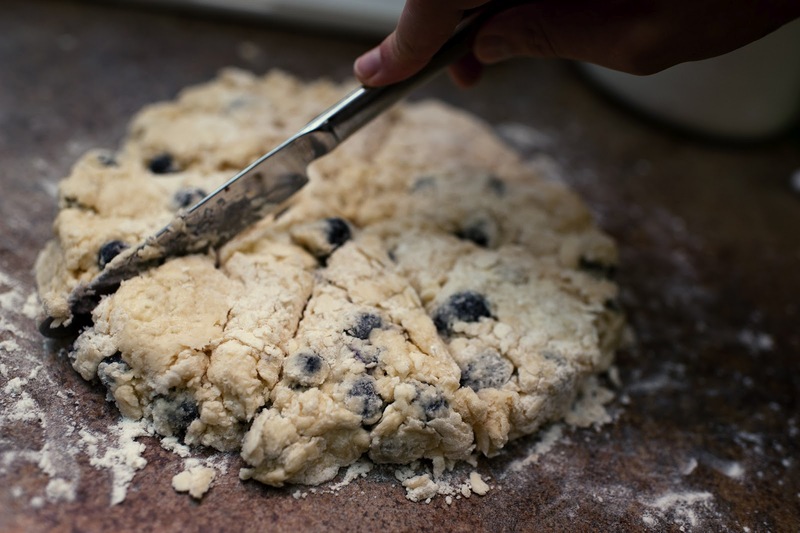 (At this point you might be wondering "Is it OK my scones are falling apart??" or maybe "I still see butter clumps! Is that a good thing?" Yes and yes! The pea sized butter clumps is what will make them flakey! We're not making cake here! 12. Sprinkle a generous amount of sugar-in-the-raw on top! their own type of texture. 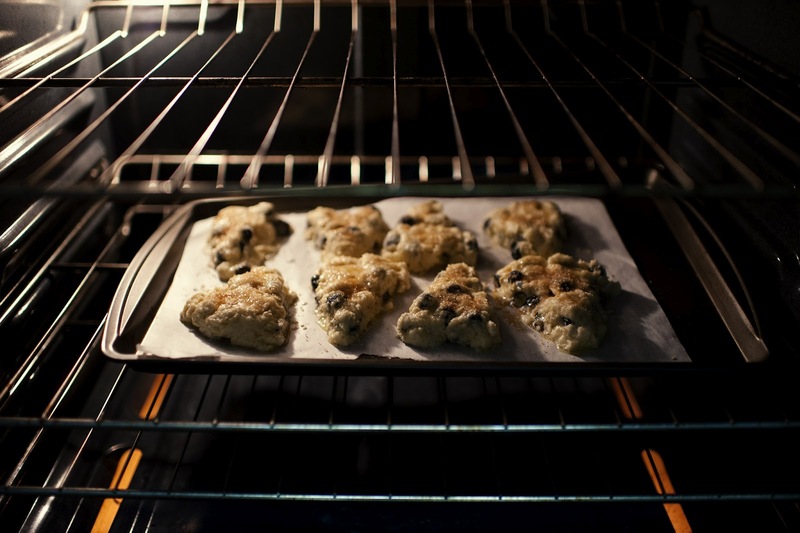 The second best part: place scones in the oven! This is your glorious handy work in the making! Well done. to the bottom! 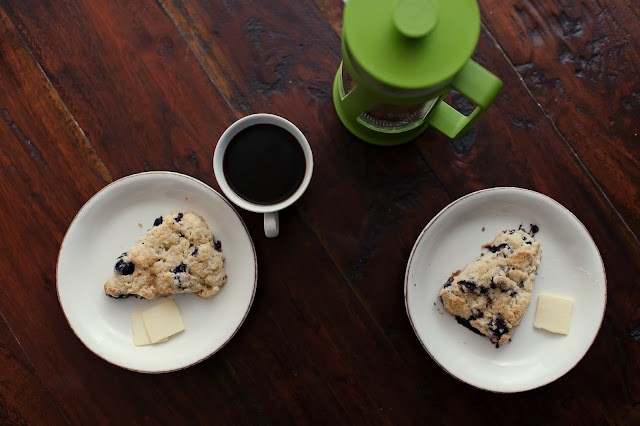 Otherwise, closer to 18 minutes is great for a golden brown scone. As one of my chef friends say "How do you know when they're done?" "They're done when they're done!" shoot me an email! I'd love to see your creation!